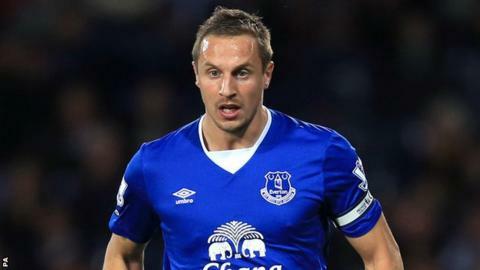 Everton defender Phil Jagielka will be out for two months with the knee injury he suffered in Saturday's 2-1 Premier League defeat at Arsenal. The 33-year-old suffered the injury in a challenge with fellow England international Alex Oxlade-Chamberlain. He will miss his country's friendlies against Spain and France next month. However, Toffees boss Roberto Martinez described it as "good news" as it was initially feared Jagielka had seriously damaged his medial ligaments. "After the game we expected the worst," said Martinez. "It's probably the least it could be. I wouldn't expect anything longer than eight to nine weeks and we've got an international break in the middle so hopefully he's not going to miss too much action." Jagielka could miss as many as nine Everton fixtures, up to their Boxing Day league match at Newcastle.